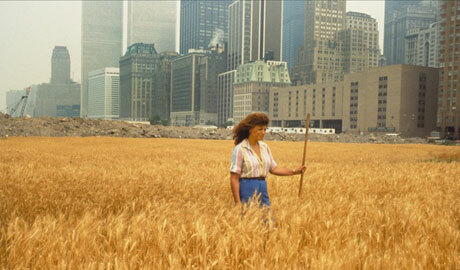 In 1982 Agnes Denes, one of the early pioneers of both the environmental art movement and conceptual art, carried out what has become one of the best-known environmental art projects. 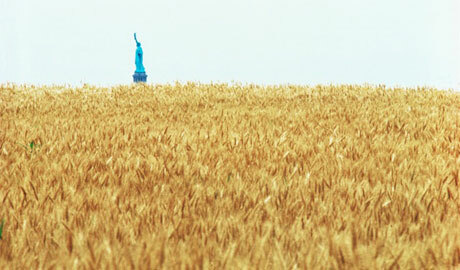 She planted a two-acre field of wheat in a vacant lot in downtown Manhattan, two blocks from Wall Street and the World Trade Center, facing the Statue of Liberty. 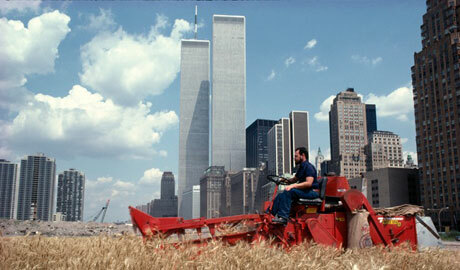 Wheatfield - A Confrontation yielded 1,000 pounds of wheat in the middle of New York City. Planting and harvesting a field of wheat on land worth $4.5 billion created a powerful paradox; it represented food, energy, commerce, world trade, and economics. It referred to mismanagement, waste, world hunger, human values and ecological concerns. It called attention to our misplaced priorities. 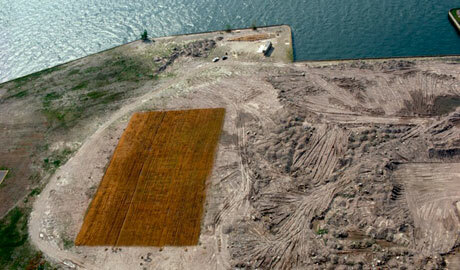 The harvested grain then traveled to 28 cities worldwide in "The International Art Show for the End of World Hunger" and was symbolically planted around the glob­e. "Manhattan is the richest, most professional, most congested and, without a doubt, most fascinating island in the world. To attempt to plant, sustain and harvest 2 acres of wheat here, wasting valuable real estate and obstructing the ‘machinery’ by going against the system, was an effrontery that made it the powerful paradox I had sought for the calling to account. It was insane. It was impossible. But it did call people's attention to having to rethink their priorities and realize that unless human values were reassessed, the quality of life, even life itself, was in danger... Wheatfield was a symbol, a universal concept..."